This guest blog for our campaign #FamiliesDeserveJustice comes from Karen Thomson, whose partner Graham Meldrum was killed at work on 12 July 2005. Karen tells of her pain and anger in the years spent tackling the injustice of corporate killing. 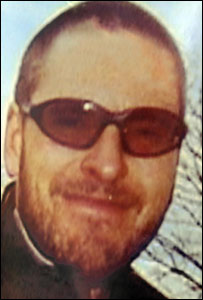 My partner Graham Meldrum was killed at work on the 12th of July 2005, another person who left for work never to return. He was working as an agency driver for TNT and delivering to Allied Bakeries in Glasgow. All these years on, it’s a different grief now. A feeling of desolation at all he missed. Aw the weans born, the weddings, achievements. Aw these years later and Catriona, who was 13 when Graham died, she is just coming to terms with the trauma. I still have the bed he made me, welded in the dark winter nights in his garage, and the next generation of weans play with the easel and the motors he created. His beloved trike has also been reborn – the Asbkonda2 – and my wheelchair-using pal James is a biker again. I absolutely with every ounce of my being support this campaign, just to save one family this lifelong feeling. More than that, I’m sometimes consumed with rage that we still need to. Because Graham, he was a loving family man who cared for many causes, choosing not to use his University degree (he had a PhD in Chemistry) to work in the corporate world he disliked so much, instead opting to work for a company with common beliefs to him, Greencity Wholefoods, a workers’ cooperative where all workers have a say in the way the company is run and conducts business. Graham rose to be their transport manager and it was during a sabbatical from his job that Graham was killed, a sabbatical taken partly to gain further HGV qualifications to cope with Greencity’s expanding business necessitating an increase in the size of its fleet and the class of vehicles used. He had been employed by Bellshill employment agency Suziline who went out of business and were never charged with any offence. Grahame was sent to work for TNT on a contract they had with Allied Bakers to deliver products across Glasgow. At some point between 5.15pm and 6.15pm on the 12th of July 2005 Graham received fatal injuries when his head became trapped in a faulty tail lift on an articulated trailer belonging to Allied Bakers, later to become ABF Grain Products Ltd. There had been several issues in relation to tail lifts of the type fitted to the trailer stretching back eight years to 1997 and this had been compounded by the lack of adequate maintenance of this one where vital safety components were broken. They were not replaced because the company had taken a decision not to do so, a decision that led to Graham’s death and one that our family and friends and friends have had to live with. The 12th of July 2005 not only marked Graham’s death but also the start of a campaign for justice for Graham and answers as to why Graham died. The Fatal Accident Inquiry held over five years after his death provided some answers but also posed more questions for us that did not come out at the court hearing, why did the deliberate failure to maintain this tail lift and others like it not attract a more serious charge that reflects the level of culpability of companies and their senior managers in a death. ABF Grain Products Ltd was fined £19,500 and TNT Logistics fined £14,000 after the court heard that Graham died due to a lack of adequate training and a failure to maintain vehicles. ABF were convicted for three breaches of health and safety legislation relating to failure to maintain their vehicles and TNT one breach of failing to provide adequate training. The training that Graham received fell far short of that provided to permanent TNT employees. The Sheriff said he was limited by Parliament in the level of fines he could impose for the offences to which both companies pleaded guilty. I am sure they would not have been as willing to enter a plea of guilty had the charge been culpable homicide. In our experience we may have had some answers, but Graham has not had justice, I have suffered the same injustice, Graham’s and my parents died having been denied justice and still to this day it would appear to be impossible to hold companies to account for acts of homicide in the workplace. Our loved ones should not be memories, they should be living and breathing alongside us, living life to the full. Instead Graham was denied his future. I am supporting these proposals in another attempt to secure justice for Graham, for all other families who have suffered the same torment and injustice as I have and to ensure that fewer families must do so in future.